Origin and Habitat: Escobaria emskoetteriana is distributed in Mexico, in the states of Coahuila, Nuevo Leon, and Tamaulipas, and it also occurs in Texas (plain of the Rio Grande), United States. The species is common throughout its range. Altitude range: It grows at elevations of 332 to 420 metres above sea level. Habitat and Ecology: The species occurs in thornscrub. It has been reported from limestone of hillsides in desert or grassland. E. emskoetteriana is wide-ranging, abundant, and there are no major threats. 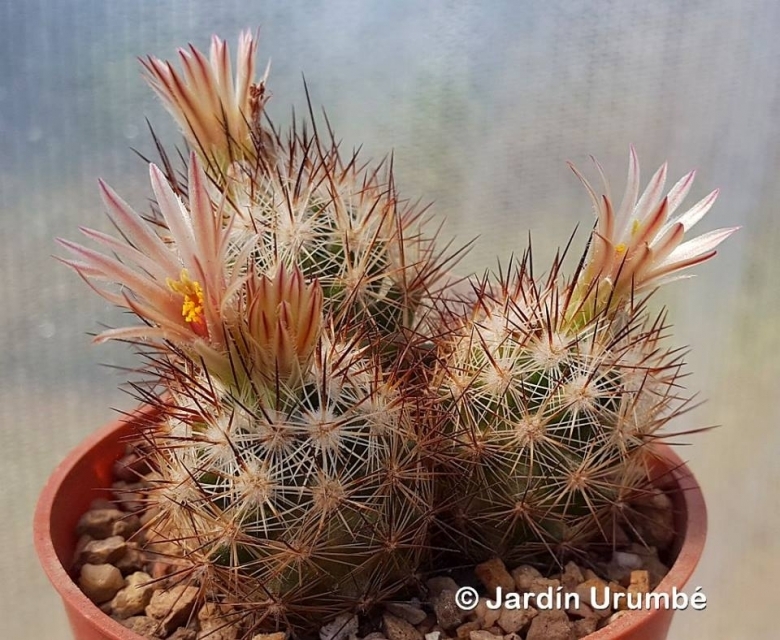 Description: Escobaria emskoetteriana a globose to short-cylindrical cactus, forming clusters 5-10 cm high. It is very variable. Stems: Globose to short cylindrical, 5-12 cm tall, 2-2.5(-4) cm in diameter and often branching. Tubercles: 6-10 mm long, conical, often not persistent and their axils naked. Radial spines: (15-)20 to 25(-30), white, straight, spreading irregularly, to 10 mm. Central spines: (5-)6 to 8, often appearing as radials, setaceous, white to yellow with dark tips, straight, to 12 mm. Flowers: Dirty white, greenish yellow, lavender, pale purple or brownish yellow, l, 2-2.5(-3) cm long and in diameter, the perianth-segments with darker or brownish mid-stripes; stigma-lobes greenish, sometimes tipped with brown. Fruits: Spherical to ellipsoidal, red, 6-9 mm in diameter, red or purplish. rarely remaining green. 8) Heil, K., Terry, M. & Corral-Diaz, R. 2013. Escobaria emskoetteriana. The IUCN Red List of Threatened Species 2013: e.T152135A601168. http://dx.doi.org/10.2305/IUCN.UK.2013-1.RLTS.T152135A601168.en. Downloaded on 22 August 2017. 9) Martinez-Avalos, J.G. and Jurado, E. 2005. "Geographic distribution and conservation of Cactaceae from Tamaulipas Mexico." Biodiversity and Conservation 14: 2483-2506.